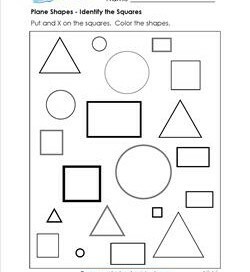 In this plane shapes worksheets kids color only the squares. When they’re done they can use their counting skill to count how many there are (hint: 16). 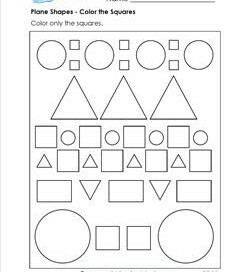 This plane shapes worksheet is like hide and go seek, except the shapes are hiding in plain sight. Kids put an X on the squares, then color all the shapes. 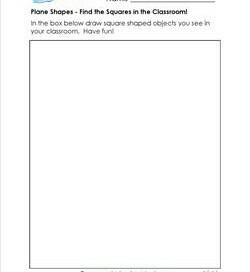 Plane Shapes – Find the Squares in the Classroom! O.K. so this looks like a plain sheet of paper, and it is. But it’s here to give you the idea of having your kids identify and draw squares in their environment. 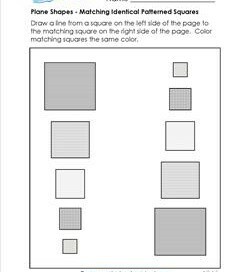 On this plane shapes worksheet kids draw a line across the page to match identical squares. 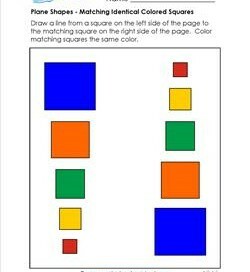 Color matching squares the same color. 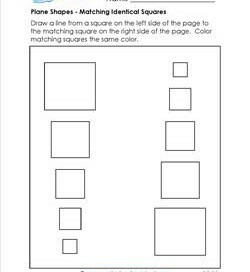 Kids draw a line from a square on the left side of the page to the matching square on the right side of the page. Kids draw a line from one side of the page to the other, matching identical squares. Coloring is optional.